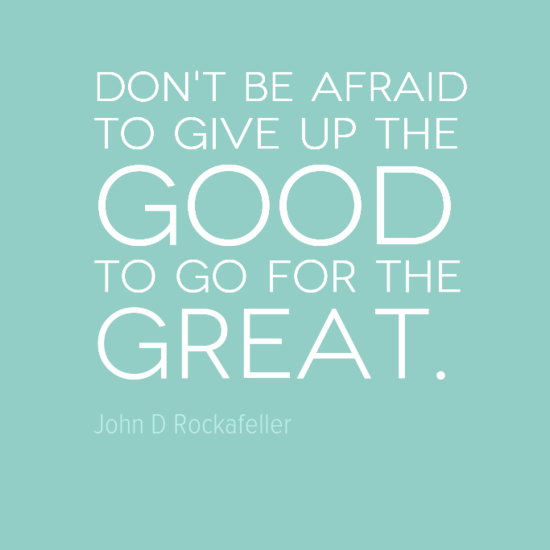 Would you give up the good to go after the great? 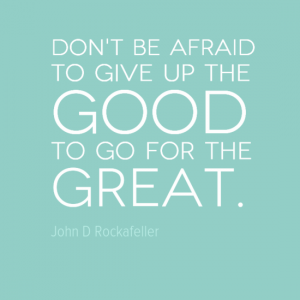 American businessman and philanthropist, John D Rockafeller, suggests we shouldn’t be afraid to do this. Who was John D Rockafeller? John Davison Rockafeller was born in New York in 1839. He was the second of 6 children born to con artist William Rockafeller and Eliza Davison, a homemaker and devout Christian who worked to provide a stable home environment. At the of 16, Rockafeller got his first job as an assistant bookkeeper working for a small produce company. In 1859, he set up his own produce company with his business partner Maurice B Clark. In 1863, together with several business partners he built an oil refinery in Cleveland, later buying out several of the partners. In 1870, Rockafeller formed Standard Oil and began a cycle of buying competing refiners, improving the efficiency of his operations, pressing for discounts on oil shipments, undercutting his competition, making secret deals, raising investment pools, and buying rivals out. Standard Oil gradually gained almost complete control of oil refining and marketing in the United States through horizontal integration. Its vast American empire included 20,000 domestic wells, 4,000 miles of pipeline, 5,000 tank cars, and over 100,000 employees. Not bad for the son of a con artist. In the 1890s, Rockafeller expanded into iron ore and ore transportation. In 1911, the Supreme Court of the United States found Standard Oil in violation of the Sherman Antiturst Act and the company was broken up into 34 new companies. Although his control over the oil industry diminished the companies worth rose fivefold and Rockafeller’s personal wealth increased. In fact, Rockafeller is often regarded as the richest person in history. Rockafeller’s wealth, when adjusted to 2007 figures, was estimated to be US$336 billion. Rockefeller spent the last 40 years of his life in retirement at his estate and used his fortune was mainly to develop a modern systematic approach of targeted philanthropy. He was able to do this through the creation of foundations that had a major effect on medicine, education and scientific research. His foundations pioneered the development of medical research and were instrumental in the eradication of hookworm and yellow fever. Rockafeller was a devoted Christian and supported many church-based institutions (from his very first paycheck, he gave ten percent of his earnings to his church). Rockefeller is also stated to have adhered to total abstinence from alcohol and tobacco throughout his life. He was a faithful member of his Church congregation, where he taught Sunday school and served as a trustee, clerk, and occasional janitor. Religion was a guiding force throughout the life of Rockefeller and he believed it to be the source of his success. Rockafeller died in 1937, at the age of 97.